Garnishes: Lemon wedges, and chopped fresh flat leaf parsley. Combine flour, salt, and pepper. Dredge chicken in mixture. Melt 2 T. butter with oil in a large skillet over medium-high heat. Add chicken, and cook about 6 minutes on each side or until golden brown and cooked through. Transfer to a serving dish and keep warm. 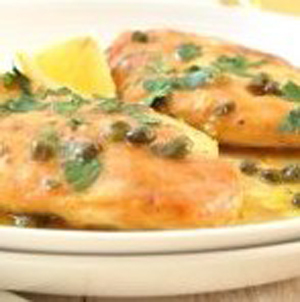 Add Lemon Caper Sauce to skillet, stirring to loosen particles from bottom of skillet. Cook 2 minutes or just until thoroughly heated. Spoon sauce over chicken and garnish, if desired.